1919 - San Diego Dining Dish! One thing that is exciting about the Gaslamp Quarter of San Diego is that there is always something new happening. Whether it is a festival or a new restaurant opening, there is always something on the docket for fun in our downtown district. A new winner has opened right on 5th Avenue, 1919. Besides the downstairs bar, there are upstairs and downstairs "speakeasy" spots that are a little more cozy. Perfect for pre-dinner drinks and fun! 1919 is a sports bar, but different than the loud, garish bars that most of us know and love. I like going to the blaring bars just as much as anyone, but I also like chatting with my dinner companions. 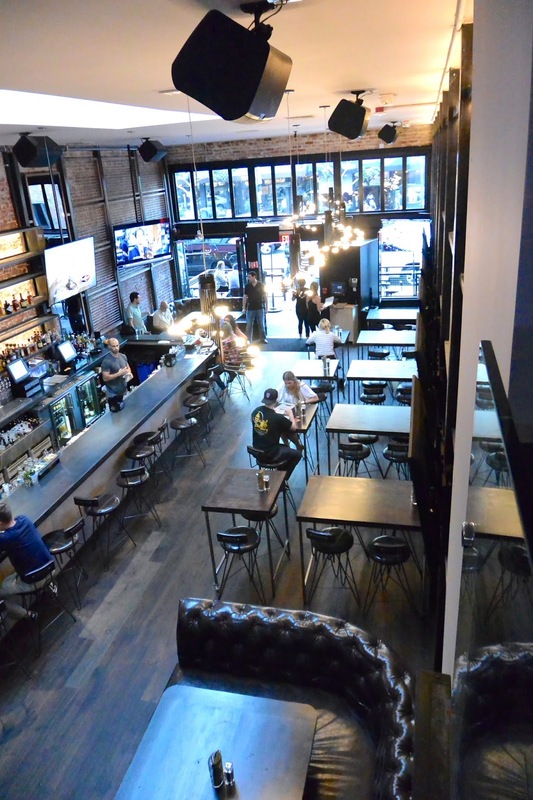 1919 is a sports bar, yes, but it's a bit more sophisticated than your normal wall-to-wall screens, favoring instead sleek lines and exposed brick. 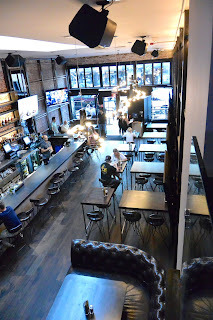 We checked it out last week, and I can honestly say that it is a superb addition to the Gaslamp! The menu is carefully created to include bar favorites made with gourmet ingredients. We started the night with some of their signature drinks -- The Tequila, a very spicy lime and soda concoction with jalapeno! It was recommended by our server, and she was spot on. I've never had anything like it, and it was delicious! The Gin was our other selection, which was again recommended. It was very refreshing, and did not have the gin aftertaste at all. I'm not normally a gin drinker (although I am beginning to like it more), but I really liked this drink! The feature at 1919 is their burgers and sandwiches! I love buffalo chicken, so of course, I chose the sandwich. The sandwich is basically deconstructed chicken wings, boneless and served on a pretzel roll. The sandwich was topped with bleu cheese, lettuce, and tomato. It was quite good, eaten open-faced, as it was too "full" to eat with my hands in a dignified manner. The hamburger is a noble staple of pub cuisine, and seriously, no better food has been invented for chowing down with buddies and drinking cold beers. The burger was served on artisan bread, grilled to a perfect temperature. The homemade french fries completed the classic bar meal. A couple more drinks were in order -- Tito's mule and The Rye. Both drinks were perfect after-dinner cocktails. Slightly sweet, and refreshing. For dessert, we had a deconstructed apple pie with homemade ice cream. The apple pie was more like apple fritters, served hot, with the ice cream soaking in nicely. Even though we just went last week, I'm already thinking that this will be a great place to catch the Stanley playoffs this spring. I really enjoyed the atmosphere, and it was so nice to be able to chat with everyone while watching the game!